EconomicPolicyJournal.com: Is the US Dollar Slowly Eroding as the World's Global Reserve Currency? 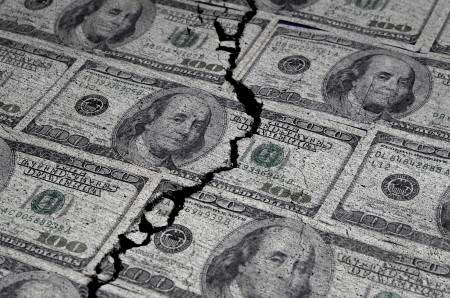 Is the US Dollar Slowly Eroding as the World's Global Reserve Currency? With the U.S. adding sanctions on various countries, overseas companies and overseas individuals at an accelerated pace, countries around the globe are getting nervous about holding dollars as their sole reserve currency--in addition to the overflow of dollars hitting foreign shores just based on current Federal Reserve money printing. Is this what is behind the U.S. backing down on blocking Iran from the global payments system SWIFT? David Brady speculates that this is likely the case. U.S. officials are aware that a global de-dollarization is occurring and that blocking Iran from SWIFT would accelerate it. This is the closest you are ever going to be able to hear Uncle Sam crying "Uncle!" out loud but it does indicate that officials know that the soundness of the dollar is very fragile and at risk. I was kind of hoping years ago that Khadaffi of Libya fame could have pulled off a gold dinar backed currency. But we know all these wars are about the petro dollar and zero to do with freedom or democracy for people who don't even know what is even about. This is actually one of your better posts, and I hope you see the relationship between foreign policy and domestic immigration: in order to fix the immigration issue, the government needs to stop meddling in other countries. The Islamic Dinar gold coin and the Islamic Dirham silver coin (as well as other movements like the Liberty Dollar) have everything to do with freedom and democracy; because you can't have real freedom and real democracy on a system build on fractional reserve fraud. Gaddafi, speaking on behalf of African nations, said Europe had to solve a problem it had created. “Either you give us back our resources or you invite us in your countries. That’s a fairly straight choice,” two EU diplomatic sources quoted him as saying. I find it commendable that you’re making an effort to find common ground. However, I think the connection between foreign policy and immigration is mostly spurious. While it is true that many third-worlders are and have been victimized at the hands of western governments, and that this contributes to higher degrees of poverty and oppression, I don’t view it as being a major driving factor of immigration. The primary motivation for immigration to the west is the delta in economic opportunity. While the west might slightly reduce that delta by stopping its interference in the third world, it’s not likely to approach parity in the short or medium term. This is in part due to simple inertia, but also because most third world counties have their own problems which made them economic basket-cases. Indeed this was a main reason why many were so vulnerable to colonization in the first place (not to excuse it, but it surely allowed it to happen.) So ambitious third worlders will continue to be attracted by the superior economic opportunities available in the west. I think it’s best just to accept that, if people have the means to move, a certain fraction will. And as the world grows richer and more closely interconnected, more and more people will have those means. The only way to slow it is to slow prosperity itself. To be sure, the US and other states should quit their foreign meddling, but there are many more important reasons for doing so than trying to discourage people from moving here. I agree with some of what you said and disagree with other things. First of all, the connection between foreign policy and immigration is definitely not spurious. When your house gets destroyed, you are moving!! History goes in cycles. After World War I, the mechanization of the armies of the west gave them a tremendous advantage to impose their will on the rest of the world. So this delta that you talk about is the ability of the western world to steal other peoples’ resources (including labor), force their debt-based monetary system on them, and remove any obstacles preventing them with wars, assassinations, coups, etc. And then suddenly, “Oh look! We can pay people more after we steal from them! !” or "Oh look, these homeless immigrants want to come here!" That delta would go away very fast if Muslim countries (and the rest of the world) can use gold and silver backed money, and be allowed to not have a debt-based currency. I won’t say that Saddam Hussein, Qaddafi, or Erdogan are (or were) good Muslim leaders, but even bad or mediocre Muslim leaders that want to make their peoples’ lives a little better are killed and coups plotted against them. I talked to a handful Syrians refugees in America. They would all prefer to live in Syria even if their pay was 10% of what they can make in America, but they have no desire to fight and kill for the Zionists and their ISIS proxies, and they have no desire to fight and die for Assad; so they chose to leave. I agree there are a percentage of people (including Americans) that will choose to move to a foreign land for different reasons: Some for money, some for adventure, and many more reasons I’m sure.